Small businesses need a break… to break into the big time! The recent uproar over Ubuntu Baba baby carriers and Woolworths put the spotlight once again on the small guy versus the big guys and the challenges of small businesses being given the chance to break into the broader market. As Eustace Mashimbye, CEO of Proudly SA puts it…’every small business dreams of being on the shelves or rails of our so-called big five stores’. 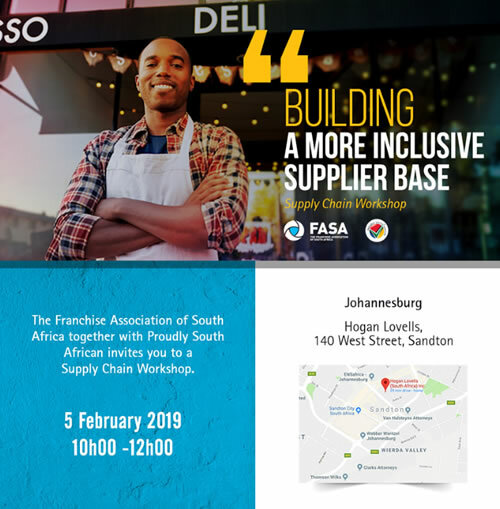 FASA is proud to partner with Proudly SA in an initiative that sees up-and-coming suppliers getting exposure to some of franchising’s top brands in a series of supplier workshops that bring both parties to the table. The success stories in Proudly SA’s supplier initiative are heart-warming and show that, with effort from both sides, great things can happen. Such as Bliss Chemicals, one of Proudly SA’s supplier members, which manufacture Maq detergents who now are stocked in mainstream stores; or Serenitii Luxury Body Care, made from some of Africa’s most exotic natural ingredients, can now be found in Pick ‘n Pay stores nationwide. Proudly SA have a mandate to educate and lobby government, business and consumers to make buy local choices, and educate them on the importance of selecting locally grown, produced or manufactured goods and services, as opposed to imported equivalents. At the same time as they are working to build the supply of Proudly South African endorsed goods and services, they are driving demand from consumers through a variety of activities and on different platforms. Buying local benefits us all – it is a key driver of job creation, keeps revenue in the domestic fiscus, stimulates economic growth, grows local investment, helps establish an industrial and manufacturing base and contributes to poverty reduction. If you are a franchisor that supplies your franchise chain, you need to be part of this ‘buy local’ initiative and play your part in building the economy through selecting locally grown, produced or manufactured goods and services. After a successful launch of the Proudly SA/FASA Supply Chain Workshop in 2018, a second workshop is being held on Tuesday 5th February from 10am to 12noon at Hogan Lovells, 140 West Street, Sandton. To protect, lobby, promote and develop ethical franchising across all sectors in South Africa with specific focus on transformation.